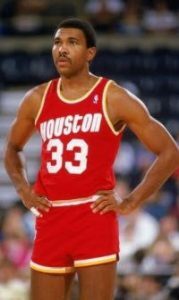 The Masters Basketball Association is excited to announce that former Houston Rockets star Robert Reid will be the featured guest at this year’s Welcome Banquet taking place on Monday, May 7 at 7:00 p.m. at The Pavilion, Seminole Casino Coconut Creek. Reid enjoyed a 13-year NBA career playing for the Houston Rockets (1977-82, 83-88), Charlotte Hornets (1988-89), Portland Trail Blazers (1989), Charlotte Hornets (1989-90) and Philadelphia 76ers (1991). A shooting guard and small forward, he finished his career with 10,448 points. Reid was an impact player in both the 1981 and 1986 NBA Finals. Both years the Rockets faced the Larry Bird-led Boston Celtics. The 1981 team was coached by Del Harris and included Moses Malone, Calvin Murphy, Rudy Tomjanovich and Mike Dunleavy. The 1986 team was coached by Bill Fitch and featured the “Twin Towers” Hakeem Olajuwon and Ralph Sampson. This year’s banquet program will be different from past year’s for the featured guest. This year we will have a “Conversation with Robert” hosted by ESPN broadcaster Dave LaMont. This will be followed by a Q-n-A segment providing the attendees the ability to ask questions to Robert.